Now that the World Series has ended with the Giants beating the Tigers in four games, the offseason can officially begin. There will be contracts signed, players traded, possibly even a Rule 5 draft pick or two in the coming weeks. We'll take a look at some of that and what the Mariners might do. Pure guesswork on my part, but so is 99% of most of the articles you'll be reading all over the internet. We'll get to all that in a second, but first, the Gold Glove Awards were announced late Tuesday afternoon. Or it could've been evening, depending on where you are and what you consider to be "evening" time of day. 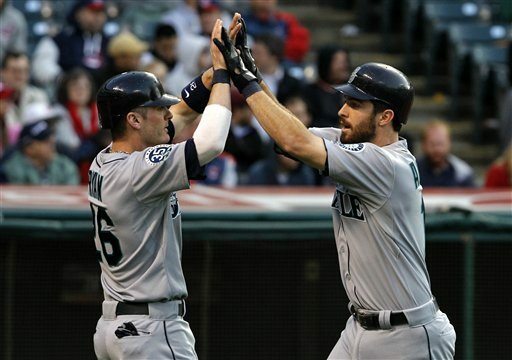 You may have heard that both Brendan Ryan and Dustin Ackley were nominated for the award. If you take these awards seriously, you may have been on the edge of your seat, waiting for the announcements. I know I wasn't, but that's because I don't really care about the Gold Glove Awards. They even took away from whatever program ESPN2 was showing at the time to announce them. I'll save you the suspense and just tell you, both Ackley and Ryan lost. Am I surprised? No. The biggest reason is because Mike Trout wasn't even nominated. Yes, I know, he's with the Angels, but you know he's an elite outfielder. And since Franklin Gutierrez played a whole 5 minutes this season, he wasn't going to be nominated. Unfortunately, the award has become more of an offensive measure rather than a defensive one. If you'd like to know who the best fielders are in the game, the Fielding Bible Awards are the ones you should care about. I don't know about you, but I'm over the whole Gold Glove thing. Other stuff is after the jump, if you care to read stuff not about the Gold Glove Awards. Should we start with the good news or the bad news? How about the good news. Because ending with bad news always gets them coming back for more. It really doesn't, but I've got an idea of what the good news is going to be and the bad news hasn't quite formed in my head yet. So instead of a bunch of random letters, something coherent would probably be the most beneficial to getting actual words typed out and an actual point across. The Mariners have Ichiro Suzuki's contract coming off the books and with that, the possibility of a veteran bat that can actually hit. That's not a guarantee, as we all know, but it's nice knowing that the possibility exists for once. It may end up being a crowded outfield already with Michael Saunders, Casper Wells and Franklin Gutierrez guaranteed spots on the roster next season. Wells is out of options and he's either going to stay with the Mariners or possibly be put on waivers. Since he's under contract for cheap and still has some upside hidden somewhere in a box he might've forgotten to unpack, my guess is he'll be with the Mariners in 2013. Saunders proved he can actually hit and most of us panicked for nothing, but it was only one year, so who knows really? Guti is just....rolls upon rolls of bubble wrap isn't out of the question. Kyle Seager and Dustin Ackley are two players that will probably stick with Seattle in 2013 unless Ackley continues to show he's forgotten how to hit. It's possible he could be sent down, but there's not really any prospects ready to take on the majors yet. Justin Smoak and Brendan Ryan are the two other wild cards in the infield. Ryan is arbitration eligible and could come back for one more year of stellar defense and coma-inducing offense. Mainly because banging one's head against the wall when he's at the plate is not completely out of the question. Smoak is a huge question mark in that we don't know what he'll bring to the table offensively next season. Although, if he were actually shaped like a question mark it would explain a lot. I've seen it reported that Jesus Montero will be working out at first base some in the offseason. I can't remember where I read it and don't want to dig it up, but it's something to think about. At catcher is John Jaso and Jesus Montero. After watching the 2012 Mariners play, it's reasonable to assume that Jaso won't start at either DH or catcher when there's a left handed starter on the mound. Whether that's the best course of action or not, I don't have a clue. I can get mad and throw things at the TV, but that doesn't mean I know any better than anybody in that clubhouse. I read that sentence twice and dislike it, but there it'll stay because I can't come up with anything better. I digress. Montero might, MIGHT, end up being a serviceable catcher at some point in his career, but 2013 ain't it. If he can take a step forward in his offense, he'll be a few hundred steps up from Miguel Olivo at least. Mike Zunino might be a possibility to get semi-regular playing time next season, but he hasn't played a full year as a professional and that's asking a lot from a kid. I'd expect a few backup catchers being signed at some point this offseason. For pitchers, there's Felix Hernandez, possibly Jason Vargas, Blake Beavan and Erasmo Ramirez as starters. Beavan isn't a lock for a spot in the rotation, but he's got a better shot than Hector Noesi. Hell, I have a better shot than Hector Noesi. There's always the possibility that one or two of the Taijuan Walker, Danny Hultzen, James Paxton trio makes it as a starter and gets inserted into the rotation, but I wouldn't bet money on it. Walker is still pretty raw, Paxton throws strikes like my niece eats her veggies* and Hultzen was scary bad in the last half of the AAA season last year. Hernandez is really the only guarantee this early in the offseason, with Vargas going to arbitration and may not be offered a contract, Beavan still being scary even as a 5th starter and Ramirez wasn't exactly a picture of health in 2012. Jack Z may opt to do what he did last year and sign another cheap veteran to hold down a spot until one of the younger guys proves he's ready. Another route might be to try and re-sign Hisashi Iwakuma, but may be out of their price range after proving he can be effective against major league hitters. It's an area to keep an eye on and to not be surprised if another Kevin Millwood type starter is picked up on the cheap. The bullpen, for the most part, is probably set. Even if it's not, bullpens are so fluid none of the relievers from last year will finish out 2013. Given Jack Z's propensity for signing 500 relievers in the offseason, it wouldn't shock me in the least to find Stephen Pryor and/or Carter Capps back in the minors at the start of the season. I very much doubt that anybody but Tom Wilhelmsen will be the closer next year, but as we saw with Brandon League, that's not a spot that's set in stone either. This is one area where if the bullpen was exactly the same as last year or completely different, it wouldn't surprise me either way. Hopefully I didn't forget too much. Also, the Mariners 40-man roster stands at 35, meaning there are 5 open spots. It's definitely not going to stay that way, but it's not going to be completely filled with free agents. Minor leaguers need to be protected in the Rule 5 draft and the only way to protect them is to put them on the 40-man. The front office may also decide to take up a spot on the roster by selecting a reliever, much like they did with Lucas Luetge. Right now, there are just way too many possibilities to even begin deciding which way the Mariners are going to go. Speaking of which, now for the bad news. I say bad news, but I'm not entirely sure it's all that bad. The Mariners payroll last year, according to Cot's Baseball Contracts, was roughly $84.9 million. You might think that they have $20 million of wiggle room, give or take. That may be true. The contracts go back to 2000, and I don't see the payroll going up much, if at all. Because I like visual things, here's a visual thing! Last year's payroll was more in line with what the payroll had been in years past. 2007 and 2008 were out of the norm for the organization, at least in the last 12 years. Last year's payroll was actually closer to what it's been for the past few years, rather than the $110+ million it was just a few short years ago. I'll put it this way. Average payroll since 2000: $88,624,521. It would be nice if the payroll would get to about $95 million, even $90 million with some of the contracts coming off the books, but I don't see it. Attendance has been down, which means profits are down, so why raise the payroll? I know what you're thinking. If they'd put a decent product on the field, people would be more likely to attend and it would justify the higher payroll. I agree completely. I really do. However, baseball is still a business. If the people aren't coming, you have to cut costs somewhere to keep your head above water. Boohoo, they're only making $20 million instead of $50 million (probably not even close, but it makes my point). I get that too, but we're talking a business that brings in billions of dollars annually. We won't know for sure what the payroll might be until the offseason is well underway and we see what the front office is doing. I hope it doesn't spiral to the point of, say, the Pirates or Astros. I sincerely doubt that, but it's still back there in your head, whispering away and making you bang your head against the wall. I'd stop doing that by the way. It hurts, trust me. At any rate, we really won't know what's going on until it's actually going on right in front of us. All we can do is cross our collective fingers and see what happens.